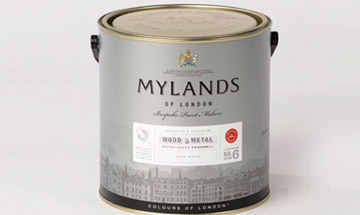 Mylands Wood & Metal is a beautiful paint available in three classics, flawless finishes, matt, eggshell and gloss, suitable for use on interior and exterior wood and metalwork. These are waterbased alkyd topcoats for use on timber and metal substrates. They replace the old oil based products, but with no compromise on performance. They are suitable for interior (including kitchens and bathrooms) and exterior use. The products are low odour and environmentally friendly. They have excellent coverage properties. They offer excellent resistance to mechanical damage.